One of the traditional parts of the Senior Patrol Leaders Investiture is the presentation of the Senior Patrol Leader’s Bolo. It was purchased in Alaska and was presented for the first time in 1999 to Hunter Neimi when he was SPL. Thirty outstanding Eagle Scouts have worn this bolo since it was first presented. Each of the thirty served a winter term or a summer term for a six month period of time. The bolo was chewed on by Matt Carney’s dog in 2004 which added personality to the object. It will be presented again in several weeks for the thirty-first time. Every Troop has an adult patrol. Geezers, Old Timers, Old Fogies, whatever. Troop 26 has the Gladiator Rhinos. It has been our adult patrol name for years. This photo is of the Rhino Patrol Flag, carried by former Assistant Scouter Jim Foutch. The Gladiator Rhino attached to the top was carved by a former Assistant Scoutmaster George Lawhorn. The Scoutmaster’s Trophy. A large golden eagle. Presented for the first time to Eagle Scout Keith Forehand in 1983. It was awarded to Eagle Scout Randy McGuire in 1984 The intention was to honor Eagle Scouts who continued to serve the troop, providing invaluable support, leadership and assistance. The best of the best. 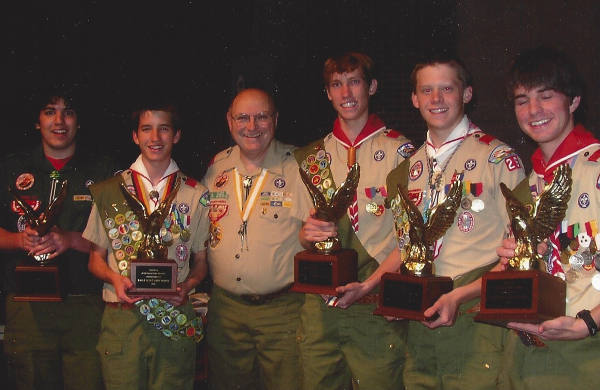 This photo was taken of the group of five Troop 26 Eagle Scouts who were presented with the Scoutmaster’s Trophy in 2005. All these scouts are now grown men and each have become scouting legends and memories that I think of often. Eagle Scouts Jake Jorishie, Andy Points, Charlie Spears, Daniel Rusco and Trent Wood. We are today what they helped build in days past. This is a really old photo. Exact date unknown. Back in the middle to late 60s. It was sometime before 1969 because this photo was taken in the basement of the old church at 11th and Sandusky. 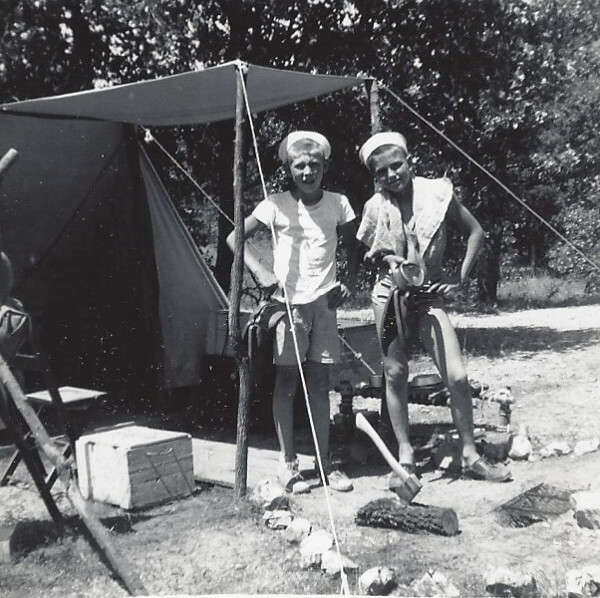 On the left is Scoutmaster Bud Kunze. The two leaders are, I think, Bob Moses and Earl Cox. I may be wrong about that and, in fact, Bob Moses may have been the Scoutmaster. I’m not sure when Bud took over from Bob. Rick might know. I can remember some of the young men on the floor but not all. The boy on the left with his back to the photographer I think is Jeff Glanz. The boy with his hand up pointing at the Advancement Chart is Mitch Dittus. His little brother, Tommy, now Tom Dittis, was one of my first recruits in 1969, made Eagle Scout and later started the Blue Rose Cafe on South Peoria. Mitch has passed away but when he grew up he was instrumental in getting the Tulsa Street School started on the site of my old elementary school, Franklin on 11th and Yale. Right behind Mitch in the photo is Warren Peters. The scout in the very middle with the different type of neckerchief on, I’m almost sure, is Rick Hayes. Look at all those ribbons on the wall. Look at all that perfect uniforming. Troop 26 had a great history long before I got there. 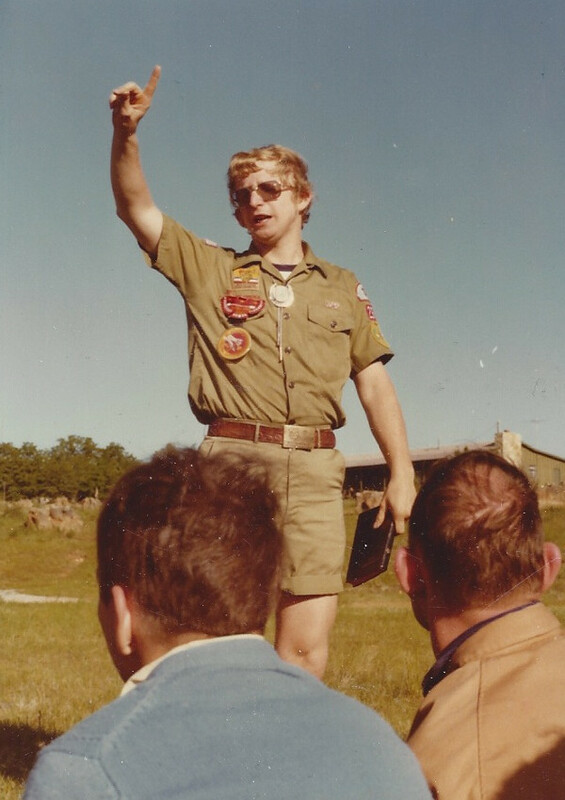 When I arrived at Good Shepherd Lutheran Church on the first Monday night in 1969 to become the new Scoutmaster for Troop 26, Bill Kirwin was one of the young men present that night. He became an Eagle Scout and was also my Senior Patrol Leader in 1970. This is a photo of Bill in 1972 when he became the Lodge Chief of the Ta Tsu Hwa Lodge of the Order of the Arrow. This is a photo from 1955. Fifty-nine years ago. 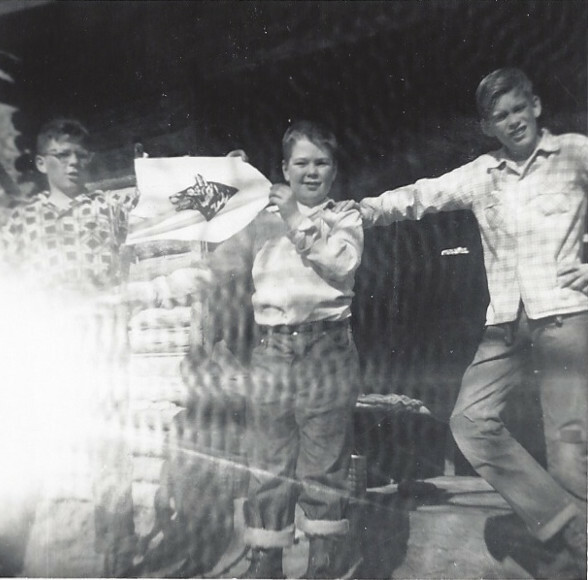 The scout in the middle, the one holding the patrol flag, is Gailard Sartain. A member of Troop 26, Gailard Sartain went on to graduate from Rogers High School and the University of Tulsa. He became a Tulsa celebrity in local television when he appeared as Dr. Mazeppa Pompazoidi in 1970-73 on the “Uncanny Film Festival and Camp Meeting.” He dressed in a long robe with moons and stars on it and had a long pointy wizard’s hat. Actor Gary Busey got his start on the Mazeppa show, playing a character called Teddy Jack Eddy. Gailard joined the comedy team of the Sonny and Cher show and then went on to be a member of the cast of Hee Haw. Gailard worked with some of Hollywood’s best in films like The Outsiders, Elizabethtown, Earnest Goes to Jail, Fried Green Tomatoes, and Mississippi Burning. He has worked with Gary Busey, Orlando Bloom, Kathy Bates, Gene Hackman, Tom Cruise, Jessica Tandy, Ted Danson, Rob Lowe and Patrick Swayze. This photo is is of a young scout who followed his dream to be in the movies. He was in Troop 26 back when I was first joining. He was quite a character. This photo was taken at the FDR Memorial in Washington after the 2001 National Jamboree. There were 42,002 participants at the Jambo at Fort A.P,Hill, Virginia. TheMemorial was one of the places we stopped to visit on the return home. 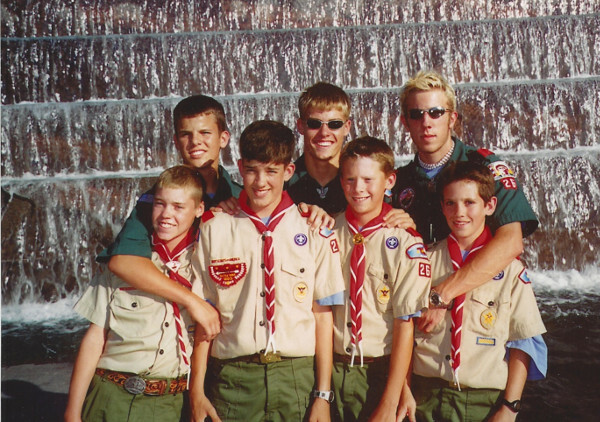 Seven Troop 26 Scouts, three older and four younger, posed in front of one of the waterfalls inside the memorial. The three older scouts are all Eagles. The four younger scouts all became Eagles. 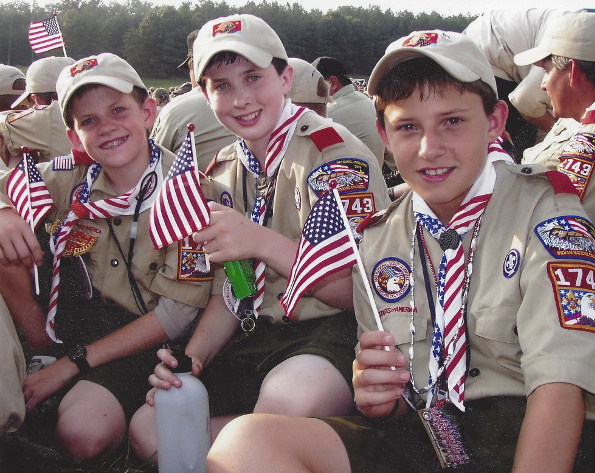 Back row, left to right: Eagle Scouts Miitch Weigt, Levi Vivion, and Todd Wagner. Front row: soon to be Eagle Scouts Robert Dennis, Reid Spears, Daniel Rusco, and Conner Wann. “Being an Eagle Scout” has reached epic proportions in Troop 26. I’m not exactly sure how many Eagle Scout Medals have been awarded by Troop 26 over the years but it is somewhere over 650. The first was awarded over 50 years ago. 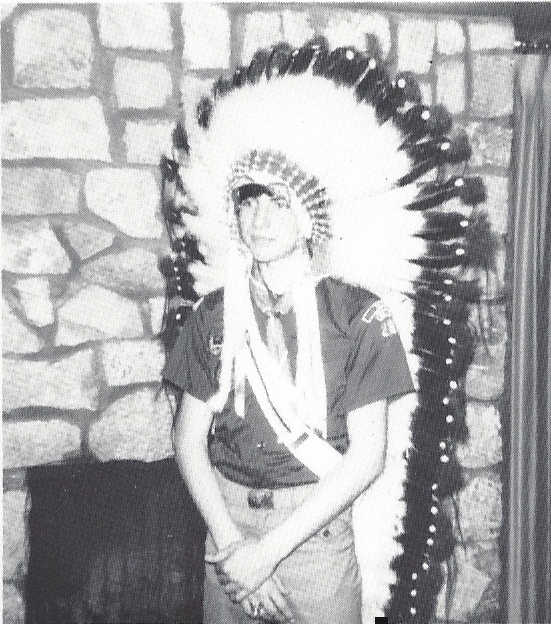 This is an early photo of Troop 26’s first Eagle Scout, Walmer Frank. He is the scout on the left. He was the son of Pastor Walmer Frank of Good Shepherd Lutheran Church. He was an older scout in the troop when I became a member in 1956. This photo was taken in 1955, about a year before I joined the troop. I remember Walmer as a great leader and an older boy that we all looked up to. Also in the picture are the old camper tents the troop used to use all those years ago. We are putting a new photo on the Troop 26 website every week but this one is a special edition. This one is dedicated to the 50 years of service given to the men and boys of Troop 26. Not just “service”. We are talking “spectacular” service. Rick Hayes. Eagle Scout. Father of two Eagle Scouts. Grandfather to two future Eagle Scouts. The man responsible for hundreds of other Eagle Scouts. A man who has been a mentor and friend to thousands of scouts. This photo is one taken back in the 70s, at one of our Special Camporees. A special photo, a special camporee and a special man. Thanks Rick, for making the light a little brighter, the road a little smoother, the rewards a little greater in all of our lives. Congratulations on fifty incredible years. And thanks in advance for the next fifty. This photo was taken in the hills overlooking the first National Jamboree that Troop 26 attended. It was 1973. The place? Coeur D’alene Idaho and Farragut State Park. There was a second jamboree that summer. Idaho was Jamboree West. Jamboree East was held at Moraine State Park in Pennsylvania. Troop 26 went west. 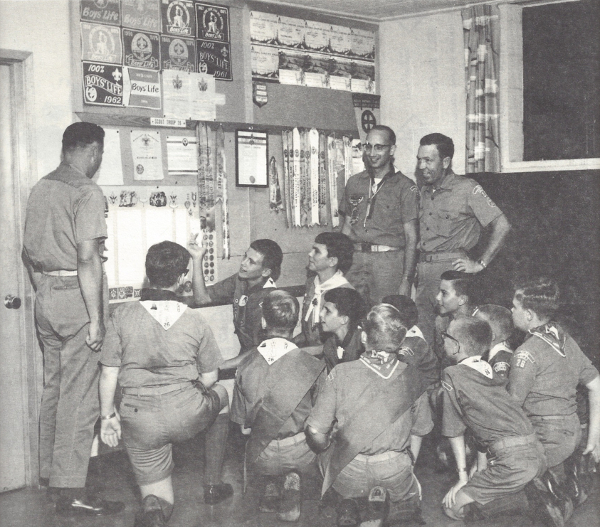 The combined total for the two jamborees was 73,610 scouts. This is one of my favorite photos from that jamboree. 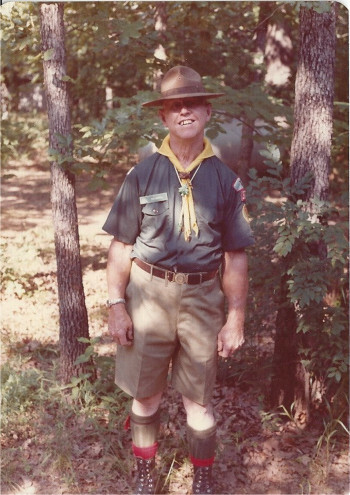 Adult leader Leon Smith was the oldest Troop 26 participant. And Scout Rol Avery was the youngest. 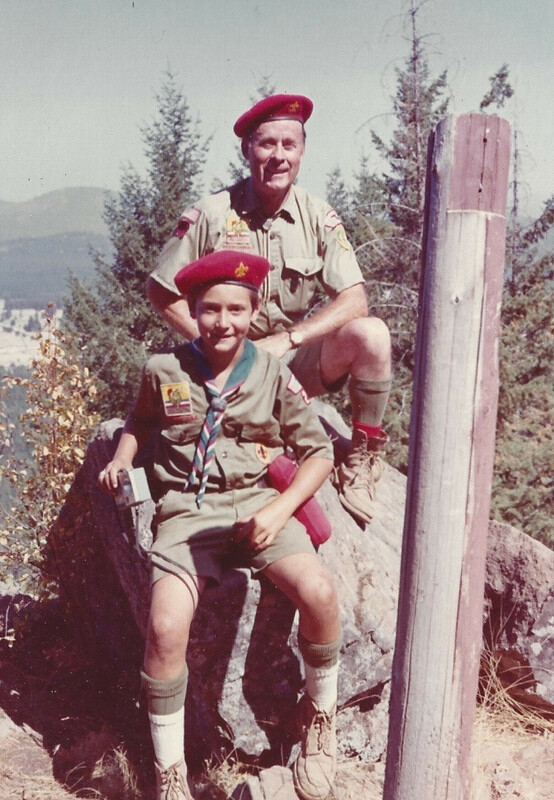 Leon was an Assistant SM with Scoutmaster Bud Kunze when I became Scoutmaster in 1969. Leon’s son, Neil Smith, was my first SPL. 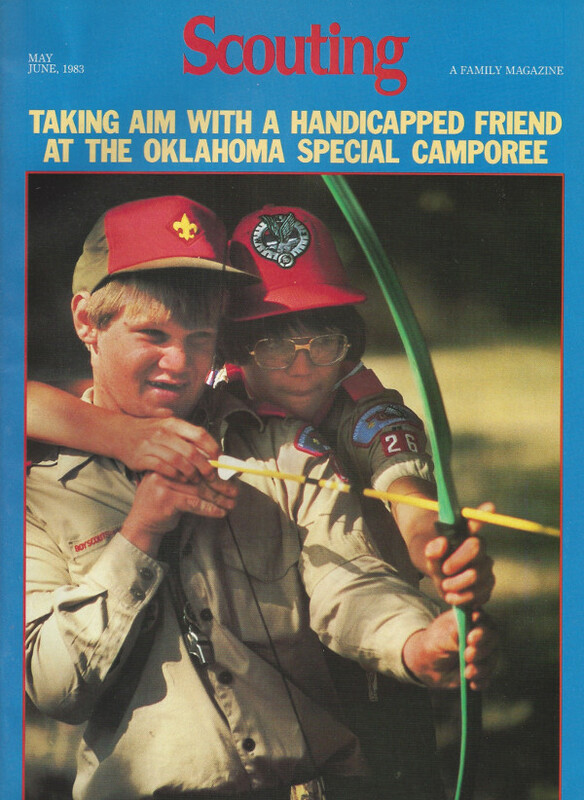 Many of our former scouts will remember a place called “The Explorer Base” situated near White Horn Cove on Lake Ft. Gibson outside Wagoner, Oklahoma. Some of our greatest memories were born at that campground. It was a Corp of Engineers property leased to the Indian Nations Council back in the 70’s. This photo is of Bob Winters, the jovial and lovable Ranger for the property. Everybody who camped at the Explorer Base remembers Bob. Friendly, helpful, and committed to the boy’s camping experience, Bob was one of the reasons we camped there. I haven’t seen many photos of Bob, this may be the only one I’ve ever seen. Bob was a valued member of the Pine Tree Staff. The Pine Tree, whose early courses were held at the Base, always included Bob in their activities. 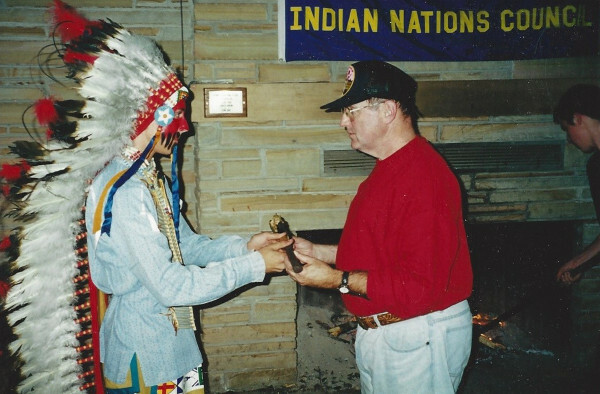 Bob Winters is a great Troop 26 memory. He was also featured on an early Troop 26 patch along with his dogs, waving goodbye to Troop 26 scouts as they went home from a wonderful weekend. This photo is a treasure. When? September 15, 1979. Where? The sanctuary of Good Shepherd Lutheran Church. What? 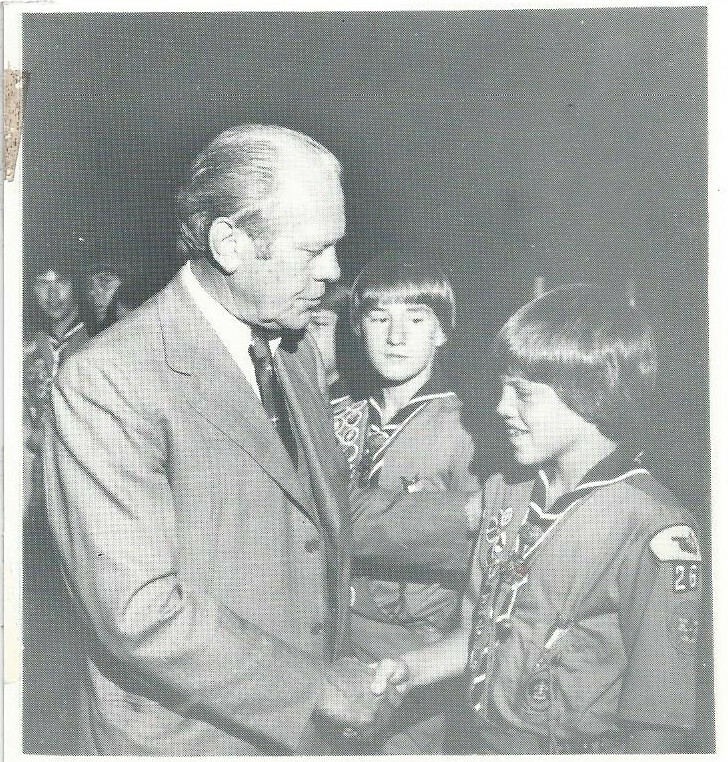 Former President of the United States Gerald R. Ford, presents 13 Troop 26 scouts with scouting’s highest honor. Gerald Ford was also an Eagle Scout. 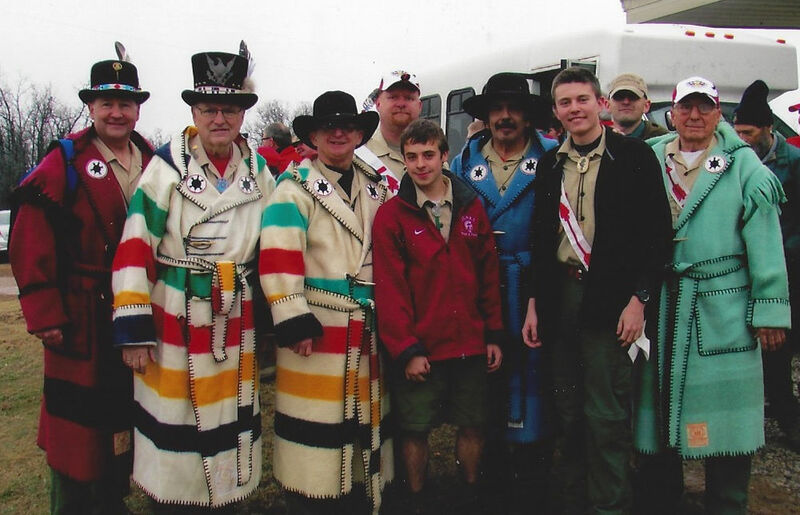 In this photograph, Eagle Scout Joel Stinnett, now a current adult leader, and the late D.J. Laurence. Special photo, special day. 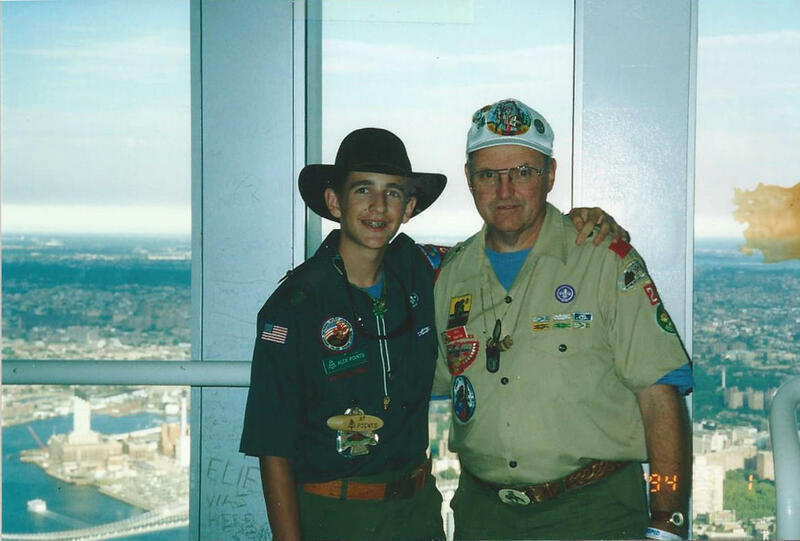 Bill and Alex at the World Trade Center during the Jamboree 2001 trip.